There are an awful lot of people walking around in fashion colors that they simply love, but that look devastatingly horrible on them. The usual reason for this is that they have selected a favorite color that simply doesn’t compliment their skin and hair color. No matter what we may love, some colors and shades look better and others can be a disaster. The general rule of thumb for colors that match skin tones relates to the seasons of the year: spring, summer, fall and winter. Winter colors are usually of the lighter skin tone variety and your colors can include yellow. Darker tones for winter include anything with a blue or pink blend. Black can look great, but the browns are shades you need to stay away from. Pinkish skin tone means you are a summer and you should be wearing pastels. Keep away from Halloween colors (except on the holiday). Autumn skin tones usually fall into the category for people with auburn, red hair and brunettes. The best colors for autumn people are oranges, browns and earth tones. The worst selection is black or white. 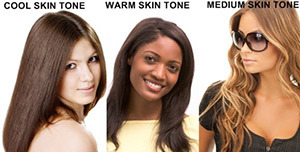 If you are a lighter skin tone, you are a spring and your colors are greens, yellows and blues. Stay away from black and white, as they will not do you justice. Once you have established what your ‘season’ is, you can begin sorting through this year’s fashion colors. You are in luck, because there is an array in the color palette like never before. The hot colors of the year are the shades of blue and various tones of purple. Pastels are also on the menu, with flavor combinations like mango, tangerine, orange, peach, apricot, and lemon yellow. The neutrals are very popular with both the boho and nature girl look as well as the infantry, desert or camo look. The combination of tans, browns, champagne, sand, and kahki are perfect for accessories like Native American jewelry or antique jewelry. There are some that choose the wrong colors and outfit combinations. You would assume that because they are celebrities, they would know better (or at least have someone to advise them). But, maybe we expect too much from them, after all, they are busy people just like the rest of us. For those that can wear black and white, the designers have come up with some outrageously fabulous patterns, looks and designs. The basic black and white, even with a touch of tan or neutral, is great for day, evening or just out for fun. While this information may have crushed some of your favorite outfits in your wardrobe, you might as well face the fact that you probably didn’t look all that great in them, to begin with. Stick with your color palette and get playful with the accessories. This can include bags, clutches, shoes, earrings, headbands, necklaces and earrings. Coordinating your look, with the right colors can mean that you will shine. The wrong colors can wash you out or bring out the wrong colors of your skin. Today’s fashion designers have made your job easy, because there are so many colors and shades to choose from. This entry was posted by Style Bust on July 3, 2013 at 2:00 pm, and is filed under New Styles in Fashion. Follow any responses to this post through RSS 2.0.Both comments and pings are currently closed.